A Shallie to save the village, and another to become a hit. Gust has shared the first direct-feed screenshots and new details on its newly announced Atelier Shallie: Alchemists of the Dusk Sea. The water sources are going dry, the plants withering, and the animals are going hungry. The once blue sea became yellow sand and those living in the sea lost their homes. Even so, the sunlight still continues to shine and there is still moisture on the ground, even if only a little. But it will dry up mercilessly. Slowly, but surely, it will certainly fade away. The world of dusk. In a sea of gravel, the willpower of the people living here has died out. Still, the town of the oasis is shining brightly, and two young alchemists met there. They make their modest livings through different means. And in doing so, they might conflict with each other and even sometimes get out of hand, but nonetheless, they will keep moving onward and upward. Shallistera (Age: 16, Occupation: Boat Family Alchemist, Blood Type: A, Height: 155cm, CV: Kotori Koiwai) – The daughter of a ship family leader. Her family has continued to protect the ship since ancient alchemical times as a relic handed down from generation to generation. She is searching for a way to save a village on the verge of life and death in place of her father, stricken with an illness of his own, and seeks support in a faraway oasis town. She heads out with her sights set for the town of Strard. Shallote Elminus (Age: 18, Occupation: Poor Subcontracting Alchemist, Blood Type: B, Height: 162cm, CV: Sumire Uesaka) – A young girl who runs a studio in place of her late father. She doesn’t have much aptitude nor experience, yielding little profit, and barely gets any work aside from subcontracting jobs. Because of this, she’s known as the “Wannabe Alchemist.” Although she hasn’t figured out how she’s going to realize her ambitions, she does her mixing from items she comes across everyday and manages to live her daily life fully in spite of her income. Without thinking too much of the consequences, she sometimes tends to go berserk. At the start of the game, players will choose to use Shallistera or Shallote as their main protagonist. Since each of their goals and desires are different, things such as event scenes will be different depending on who you choose. In the case of Shallistella, you want to save the village. Her’s is a story about the mystery of the world. A story about the heart of dusk. And a story about the growth of a brave and earnest young girl. And in the case of Shallote, you want to become big. Her’s is a comedic story about her daily life and the adventures she goes on, one in which she tries to fill the shoes of a proper Atelier. And a story about the growth of a reckless and straightforward young girl. No matter which Shallie you choose, there won’t be a major difference in how the game flows overall. Fields in this game are larger and wider than those from previous games, allowing you to find more items and raw materials for mixing. By combining items, you can create powerful weapons and equipment, as well as potions. This is a completely new goal management system that displays which tasks you should be doing at that point in time. For example, it will say, “I want to do a lot of mixing!” or “I want to advance the story!” It is a management system tailored to a variety of play styles. As you explore the world of Dusk, you’ll get a sense of how fleetingly beautiful much of it, with some of the areas also tinged with hints of nostalgia. In order to best realize such a setting, events that unfold from a first-person viewpoint have been added in order to deepen the game’s storyline. Additionally, manual camera control has been added for times when you’re wandering the field, and you can now visit any of the places you can see, no matter how far off some of them might be. A special edition will launch alongside the standard edition for 9,800 yen. It will include a four-disc music CD set, drama CD, and a premium box. 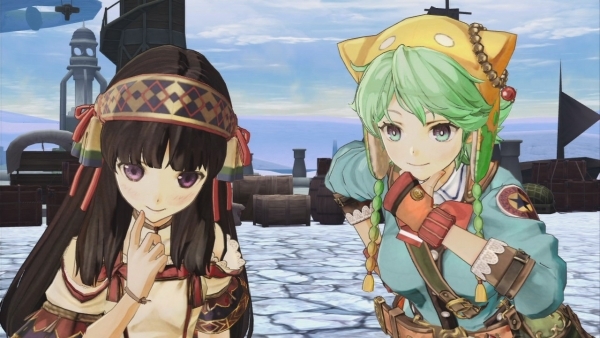 Atelier Shallie: Alchemists of the Dusk Sea will launch or PlayStation 3 in Japan on June 26. View the first set of screenshots at the gallery.